Football - Salem v Illingworth St Mary's. St Mary's keeper Richard Langley. AFC Crossleys are through to the Covea Insurance Invitation Cup final but their opponents are yet to be confirmed after the abandonment of Saturday’s other semi-final. Division Two leaders Crossleys were tested by Shelf FC Reserves from the section lower but won 2-0 at Greetland with goals from Bailey Naylor and substitute Connor Atkinson. Mixenden United started favourites against Elland United from two divisions lower at Holmes Park, Luddenden Foot. However, they were 7-0 down after 70 minutes when the referee ended the contest. Reports suggest three Mixenden players had been sent off. Northowram went top of Division One in the Halifax AFL with a deserved 2-1 home success against St Columbas. On a breezy afternoon, the opening exchanges were scrappy and even. The Rams, playing down the slope, took the lead after 32 minutes when a measured cross-field ball from Jake Baker found Billy Farrell and he netted with a low finish after neat footwork. Macauley Richardson made the first of a string of excellent saves to deny Matt Calland and produced an even better stop to palm away Jake Baker’s volley. A spectacular bicycle kick, inches wide, was the closest the visitors came. Saints drew level four minutes into the second half with Frank Odion’s overhead kick from close in but the Rams gradually built the pressure and Richardson produced a flying one-handed save to foil Craig Collins. Saints had Kutubo Touray sent off for retaliation and the winner came 10 minutes from time through Olly Spencer after a corner had not been properly cleared. Illingworth St Mary’s remain one point behind, from one game less, after a 5-0 home win over bottom side Salem, aided by two goals from Jordan Wadsworth at Shroggs Park. Hat-tricks from Sam Clayton and Connor Durkin gave Brighouse Sports a first league win for fourth months in an 8-2 thrashing of Elland Allstars. Sam Durkin and Nathan Hirst got their other goals at Lightcliffe Academy. Shelf United Reserves’ promotion hopes in Division Two suffered a broadside when they were beaten 2-1 away to Sowerby United Reserves. Rowan Binns scored for the visitors at Ryburn Valley High School but efforts from Daniel Barron and Rhys Dean gave Sowerby the upper hand and completed a fine day for the club. 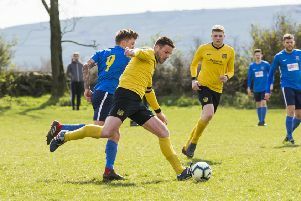 Midgley United Reserves staked their claim for second place behind likely champions Crossleys when they beat Illingworth St Mary’s Reserves 4-3 in the battle of the third and fourth-placed sides. They started brightly at Trinity Academy and took a 2-0 lead with a well-placed finish from veteran Matthew Thompson and a fine solo goal from Jake Farrar, who slotted home from a tight angle. The hosts hit back immediately with a shot from the edge of the area but Thompson made it 3-1 before half time. Illingworth scored twice in quick succession at the start of the second half and play swung from end to end. Midgley dug deep and Joe Lally’s well-guided header gave them victory. Northowram Reserves are off the bottom after crushing Stainland United 7-1 in the basement battle with the help of a hat-trick from Chris Conroy and two from Timothy Crabb. Sowerby Bridge Reserves had a 2-1 home win over Calder ‘76 Reserves and moved above opponents who are now third from bottom. Hebden Royd Red Star Reserves won 5-3 away to Crossleys Reserves in the only fixture in Division Three. The pair had been level on points at the start of the day and goals from Gareth Anderson, Matthew Clark and Nathan McIntosh were in vain for the hosts.